Here’s the 2nd Amended Complaint by Derry Dean Sparlin, Sr., they dropped the Barnitt’s, who were victims too. (Morris Family Trust lost $1-million too.) Added Hadrianus Terra, LLC, which is also a defendant in my lawsuit another mutual defendant is Tucson Acquisition & Development Corporation, both affiliated with Michael N. Figueroa and Jeffery S. Utsch, who were the prior majority lot owners, Utsch was head of the HOA too. 2nd Amended Sparlin Complaint (PDF), Why would National Bank of Arizona lend them $35-million?! Sparlin has an interest in Hadrianus Terra, I’d like to have him join our lawsuit, his lawyer has written a serious indictment against the prior majority lot owners — securities fraud! Like to also see the lot owners who lost their lots to Hadrianus and Tucson Acquisition because of the bogus Assignments (they intimidated the prior lot owners) join our lawsuit. The prior lot owner of Russo’s associate Southern Arizona Land Trust lost their lots due to despair. The Assignments of Special Assessments, which are the focus of my lawsuit are securities. From reading this Amended Complaint, it appears that Western Recovery Services had no real cash assets and from looking at the HOA budgets (See Unit 5 for 2006, page 36) it looks like WRS never paid the HOA any money for the Assignments. 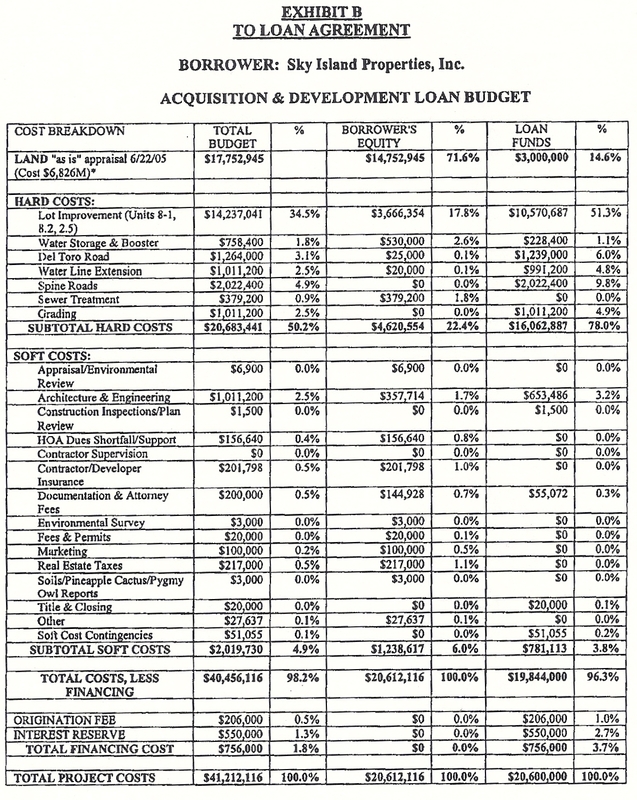 The budgets consider the WRS “Purchase Agreements” as liabilities — whatever that means? These budgets are very confusing to me. The HOA gave? the assessments to WRS and then WRS sold them to friends and investors, not sure if any of that money went to the HOA. In 2005, the development group Sky Island Properties Inc., led by Carl Pepper, took out a $32 million loan from National Bank of Arizona to buy land and make improvements there. Last November, the bank took the developers to court for defaulting on the loan and had the land placed under another developer’s supervision, court documents said. Read more. The $22-million and $9-million lot flip was between Title Security 862 and Sky Island. From the National Bank of Arizona Foreclosure in Pima County Superior Court. 1338 lots cost $6,826,000 = $5101/lot. Not sure how much NT Properties paid. This entry was posted in Uncategorized and tagged Assignment of Special Assessment, Carl F. Pepper, Corona Acres, Derry Dean Sparlin Sr, Hadrianus Terra LLC, HOA Budget, Jeffery S. Utsch, Michael N. Figueroa, National Bank of Arizona, Palatine Properties Fund, Sky Island Properties, Southern Arizona Land Trust. Bookmark the permalink. 2 Responses to Why would National Bank of Arizona lend these guys $35-million? !